This week, we're covering the fourth objective in Charlene Li and Josh Bernoff's book Groundswell: supporting (chapter 8). This chapter is perhaps the most surprising in the book, because it focuses on tools and techniques that predate Web 2.0 by years: customer support forums. Groundswell focuses on peer-to-peer support mechanisms—ways that institutions answer customer’s questions by connecting them to each other. Why should museums care about customer support? Because this is fundamentally about connecting visitors with each other in discussion about the most pressing issues related to the institution. And that's something I think we can all do a better job supporting. But first, some basics about customer support. Support infrastructure is a major cost center for big business. The average call to a call center costs $6 - $20 depending on the nature of the call (basic vs. technical support). While I’ve never heard of a museum with such a heavy call volume that they’ve outsourced their front desk to Bangalore, many museums, small and large, suffer at the phones. Many have implemented phone trees that slowly and torturously give visitors every piece of information except the one they want. Human contact is hard to come by, and while websites and phone systems provide the basics, there are many visitors with complex questions—often more interesting questions—who are turned away by the frustrating inability to reach a real person. What if that real person was another visitor? If you have a question about whether an exhibition is appropriate for your eight year-old or how long the line is to bike across the tightrope, why not get your answer from someone in a similar situation? The support forum has become a cornerstone of many businesses which benefit from the eagerness of some customers to answer each other’s questions. As Charlene and Josh point out, when a customer answers someone else’s question on an online support forum, she doesn’t just solve one person’s problem. Her useful comment is archived and can be accessed by hundreds of other people with the same problem. This spectator effect means that the online forums don’t just provide direct support—they create growing bodies of knowledge about products. All the content is provided for free, and the result is far fewer frustrated customers sitting on hold. The reason museums resist peer-to-peer visitor support is fear of erroneous and unvetted information. What if a visitor asks a factual question and someone gives them the wrong answer? Or worse, what if someone uses the forum as a venue to promote his own (off-message) agenda? It’s interesting to address these fears by looking at how other businesses manage their support forums. There are three key factors—volume of participation, implementation of reputation indices, and content framing--that keep forum conversations on-topic and appropriate. Let's look at each in greater detail. 1. You need lots of active users to make a support forum work. Charlene and Josh say the average business should expect one to five percent of customers to participate in support forums, with the actual figure coming down to how much people care about the products and how active they are as participants in social technology. If only 1% of your customers are going to talk, you need to have enough customers such that 1% constitutes a reasonable discussion base. Support forums that work well work quickly--you post a question and get a relevant response within a few hours. These forums rely on thousands of users such that your obscure printer question will find an answer in a reasonable amount of time. If there's no one on the site to respond, then putting a question on the forum is like talking to a dead voicemail box. For this reason, Charlene and Josh point out that support forums take a lot of staff time--at least at the beginning. You want to set the tone for the forum as well as a precedent for providing timely responses to questions. In the case of the computer company Dell's extensive support website, the company began with 30 staff moderating and participating in the forum, but were eventually able to cut that to five people. These five people can moderate a community with 9,000 new posts per week, because the forum mechanism is robust enough to mostly manage itself. Most museums don't have high enough online participation to sustain a major support effort. However, there are at least two ways for museums to get volume. The first is to put the museum content in a venue that does have mass participation. Consider what happened when the Library of Congress put some of their photo collections on Flickr. Thousands of people viewed the photos and supported each other's questions about the images. Their commentary included both factual and erroneous information, but the sheer volume of participation led the users to parse out what was and wasn't correct... without any intervention by the institutional authority. Another way museums can address the volume problem is by utilizing their in-person audiences. Most support forums are only frequented by people who have a problem. In museums, those "problems" could be more general questions of interpretation. I could see support mechanisms working on the floor in which visitors could post questions about individual exhibits to be answered by other visitors walking by. In this way, each exhibit becomes a specific "product" with its own small conversation thread. Even a few people participating in each would significantly increase the perception of an overall conversation happening on the floor, and repeat exposure to the forum mechanism might induce a higher percentage of participation. 2. Reputation indices reward good behavior and cultivate active participation. A reputation index is a scoring system that provides "psychic income" to people who answer each other's questions. The reputation index can be in the form of points, levels, or symbols. Dell uses bronze, silver, gold, platinum to identify users based on the number of posts they have logged; eBay uses stars. The point is not to simply reward people for their volume of participation but also for its quality. A good reputation index allows users to rate each other's answers' usefulness, so that future spectators will see the most relevant answers bubble to the top of any thread. You can learn more about designing reputation indices from this post. Museums have built-in opportunities for reputation indices--memberships and visit tracking. I've argued that museums should find ways to use game mechanics to encourage visitors to "level up" in their use of and participation in the museum. It helps people feel personally rewarded and recognized, and it aligns them more closely with the institution. Finally, it gives the museum an opportunity to use its authority to bestow "psychic income" on those it deems most worthy contributors, thus encouraging the conversations to go in preferred directions. 3. Clear content frames help people know where to find what they need. Product-related and tech support forums are incredibly specific. Most support forums are made for just-in-time learning: I have a problem, I know the error code or product name, and so I know where to go to search for an answer or post my question. In the museum world, the questions are less clear. You don't have an urgent need to know which artifacts are included in an upcoming exhibition the way you need to know how to program your garage door opener. I think this is one of the biggest obstacles to forums becoming viable for museums--there is no specific problem around which visitors can cluster. But Charlene and Josh have a recommendation for this. They suggest that it is more important to create a support platform that allows your users to have the discussions they want to have than the ones specifically related to your services. For example, the chapter starts with a case study of a community blogging platform, CarePages, that Mass General Hospital (MGH) uses to allow patients to maintain private communities with their loved ones. Patients don't use CarePages to interact with doctors or manage their care. They use it to let their friends and family know how they are doing and get support and love from those folks without the added exhaustion that frequent phone calls can bring. The hospital didn't create a better way for patients to get their questions about medical care answered. They created a better way for patients to be supported by their peers. There are also some support forums, like Yahoo! Answers, which are incredibly general. The concept behind Yahoo! Answers is that you can ask anything and someone out there will give you some useful answers, whether you ask "what makes a good museum?" or "how do I get my bowels in motion?" The questions are answered so quickly by thousands of answerers that individual questions only stay active for answering for about 4 days before being archived. Each question may only yield a few answers, but users are motivated by the authenticity of the responses--even if it's just a couple opinions from strangers. While the content may be off-topic, the general concept behind these sites is strongly tied to the idea of the museum as a place to exchange ideas and get all kinds of information. As museums become more inclusive of different stories and ways of knowing, promoting visitor-to-visitor support mechanisms may be even more valuable. There are some beginnings out there. The Science Museum of Minnesota community site Science Buzz is a sort of hybrid--a supportive community organized loosely around science. While there isn't a specific question and answer component of the site, it is a place where people come together to share stories, ideas, and reactions and feel rewarded for doing so. There's also the opportunity to use forums and other tools for industry support. Many of us use listservs to get answers to our museum-related questions and find out what others are doing. Some use wikis to share their work and provide a collaborative support space for like-minded projects. Which of these tools work well for you, and how could you imagine inviting visitors into those environments? What are the biggest questions your visitors have (which aren't answered by a basic spin through the website)? What would make you eager--or unwilling--to to allow other visitors to answer those questions? To participate, all you need is a phone. Call 641.715.3900 ext. 60138, listen to the recorded question, and leave a message with your response. Once I have a few responses I'll start posting them and adding new questions. To explore the potential use of cellphones as feedback devices. Right now, most museums that use handhelds and cellphones use them to serve content, not to receive it. Cellphone tours are smart for a lot of reasons: they use devices visitors already own and are comfortable with, they allow museums to change content flexibly, and they allow visitors to drop in on a tour as they choose. But they only activate one side of the cellphone. How often in your everyday life do you use your cellphone to call a number and listen to someone talk at you? There are at least three reasons that cellphones may be great feedback devices. First, device familiarity. People already know how to leave voice and text messages and don't have to grapple with a comment system to do so. Second, granularity. Rather than having one talkback station per exhibition, you could have a talkback for every exhibit--a unique phone/SMS number to which visitors could address their thoughts. This may improve quality as well as quantity of comments; if visitors can comment directly on individual artifacts, there may be fewer generic "this exhibition was great!" contributions. Finally, there's diversity of comment format. Visitors can send audio, text, or even video from their phones and need not be constrained by whatever particular format the museum offers in a kiosk. To learn more about the relationship between feedback format and quantity/quality of input. Last year, I did an experiment with Eric Siegel of the New York Hall of Science using the Voicethread technology to invite people to offer suggestions and critique on an exhibition plan. One of the surprises that arose from that experiment was the high participant-to-spectator ratio. On this blog, there's about a 0.5% comment rate. On the voicethread during the time it was active, there was a 20% comment rate. This was surprising given that participants were required to do a lot more to post a comment on the voicethread than on the blog: they had to register an account, have a microphone, and record their voice. Many uploaded a personal photo as well. Why did so many people participate? My guess is that the voicethread technology looks and feels more like a conversation than blog comments do. You can hear and see the people talking, and that's compelling. For the Voicemail Museum, I wanted to strip this down to an even simpler system to see how audio comments work in isolation, without the nice (and somewhat hindering) Voicethread interface. To find questions that yield amazing visitor-created content. I've often talked about my belief that Post Secret is a model user-generated content project that hinges on a great question: what is a secret you've never told before? I believe there are other great questions out there that can draw out comparably rich, surprising responses that are worth experiencing as a spectator. I figure by trying out different questions, I can see which ones are promising and which ones are duds. This could be a really simple and powerful way for visitors to share comments using their own devices. The museum would set up a bunch of unique voicemail accounts for different exhibits and then post the phone numbers on text labels. A museum without a phone system could even do this the way I did: register free phone numbers with a web-based voicemail service and receive the messages directly to your email inbox. I'll be keeping you posted here about the direction and findings from this experiment. If you'd like to share your own questions to be used in the experiment, or would like to participate as a partner venue (and test this with your own visitors), please let me know. In the meantime, share your own compelling questions in the comments here on the blog, and give the Voicemail Museum a call! The inaugural question asks you to share an aha! moment of any kind in your life (my most recent one had to do with being an elitist jerk...). This week, we're covering the third objective in Charlene Li and Josh Bernoff's book Groundswell: energizing (chapter 6). Josh and Charlene define "energizing the groundswell" as "tapping into the power of word of mouth by connecting with, and turning on, your most committed customers." In other words, find your fans, and empower them to sell for you. They start by discussing the ROI of word-of-mouth recommendations. Peer referrals are big business; the opinion of a friend or acquaintance is one of the most trustworthy sources of information about products and services, and the presence of peer reviews and ratings has been shown to positively impact sales. Amazon doesn't let you write reviews for the fun of it. They do it because it creates a credible, self-reinforcing engine of information about their products. The success of these programs relies on businesses' attention to both rants and raves about their products and services. Josh and Charlene introduce Fred Reichheld's research into the relationship between percentage of energized customers and business growth. Fred created the Net Promoter Score, a metric related to the number of people who answer affirmatively to the question: "How likely are you to recommend X to a friend or colleague?" The Net Promoter philosophy is that you ask the question, separate respondents into promoters (answered 9 or 10), passives (answered 7 or 8), and detractors (answered 0 through 6), and find active ways to support promoters and convert detractors. Charlene and Josh focus on strategies for supporting promoters via ratings and reviews, custom communities, and ambassador programs. In this post, an exploration of ways that museums can support promoters, convert detractors, and generally energize visitors to share their experience with others. Somewhere out there, there are people who love your museum. How do you support your biggest fans? The traditional way is via membership and donor relationships. You give them special perks, they give you money. But this traditional model is private, building relationships between individuals and the museum rather than individuals and the world. The word-of-mouth benefit of donor relationships is small and reaches a limited community. To energize your fans in the groundswell, you need to turn them loose on the public and give them easy ways to share their enthusiasm with others. Imagine a visitor who leaves your museum enthused about her experience. What tools do you offer for her to express her enthusiasm? Maybe a comment card or book. But I don't know of any museums that explicitly offer ways to rate or review exhibitions, collections, or visits beyond that. With the exception of North East England's i like museums site, I don't know of any museum-sponsored way for visitors to share their experiences online. Let's look at each of these briefly. 1. Don't ratings and reviews degrade the collection? I believe that visitors should be able to rate every exhibit and artifact in a museum. When I bring this up, curators bristle at the threat to their control of the experience. But these same curators probably go home and rent movies, buy books, and select restaurants based on peer ratings and reviews. There are experts in every industry, from books to film to art, and they have an important voice in the selection and presentation of content. But peer voices can add multi-dimensionality, credibility, and up-to-the-minute information to these authoritative perspectives. And allowing people to share their views gives them a venue to contribute their enthusiasm toward the institutional cause of celebrating the museum. 2. Do reviews and ratings really convert to sales/visits? In other industries, including recreation and hospitality, the presence of reviews has been shown to be both popular and effective at generating business. Charlene and Josh cite that 80% of online reviews tend to be positive, and the negative ones add to the credibility of the site (and give businesses opportunities to improve and convert detractors). When it comes to museums and threshold fear, I can't think of a more effective way to convince someone that the museum wants to include them than to say it in the voice of a peer who has had a positive experience. 3. Do visitors really want to review museums and collections? To evaluate this, you have to consider whether your visitors are Web 2.0 "critics"--people interested in judging content. You have to decide which content--are people interested in talking about specific shows or artifacts, or the whole museum experience? Being a critic requires less personal creative drive than creating other social content because you are responding to, not initiating, content. The other important role is the spectators or lurkers--the people who will read the reviews. If you have both critics and spectators in your visitor demographic, you have fertile ground for ratings and reviews. You can check out Forrester's social profile tool for a rough sense of your visitors' predilections. Chances are if they are primarily Western educated adults, they are using and writing reviews on a range of products and services already. 4. How would we implement ratings and reviews? Companies like Bazaarvoice can sell you custom Web-based solutions (for about $50,000). But there are no- and low-cost options as well. You can promote your Yelp! reviews and make it easy for visitors to view and submit reviews from your site (though that requires visitors to register with Yelp). You can use any of many free Web services like JS-Kit to customize your own ratings and reviews. While many museums are still far from seamless technology-based ways to allow visitors to rate exhibits real-time while in the museum, there are some no-tech ways to do this using post-its or penny polls. One of the most clever no-tech ratings system I've heard of is at a library in Sweden. The library has two book drops, one for regular books, and one for amazing books. They take the books from the "amazing" drop and put them on a "user recommendations" table in the middle of the library. It's a super-simple way to enable visitors to share their favorite books with each other. Charlene and Josh talk about businesses that create custom communities for their customers, focusing on those that provide business-to-business services. They point out that people who might want to review a product don't necessarily want to join a community about it (do you really want to join the Cuisinart community?). But if you offer a service, for example, museum ticketing, that is used by many professionals in similar ways, you may have a customer base that is uniquely interested in sharing their successes and challenges with each other. This could also be useful for membership and donor circles. Rather than relying on one-way email blasts and requesting that high-level donors evangelize your museum informally, you could set up an online community space where these folks can share their passion for your museum with would-be members and donors. There are some companies that create limited community features specifically to encourage word-of-mouth and shared participation. The Carnival cruise line operates a community site that is event-specific--you can easily invite friends to join you on your trip and plan your cruise together. This event or visit-based model may work for encouraging increased visitorship to museums: imagine a site that specifically encourages you to bring a friend to the museum, offers a discount for additional tickets, or gives you an easy way to send an automatic email to friends letting them know that you'll be visiting the museum on X day. Creating custom communities is expensive, and many museums or museum service providers may not have enough constituents to justify it. You may be better off energizing those who have formed their own communities around your content. Is there an unauthorized MySpace page about your museum or some key element of your content? Is someone posting videos on YouTube using your museum as a backdrop? If you identify positive, interesting voices in the larger Web community that address your institution, you can reach out to these folks and make them your ambassadors. Give them some membership-style perks--advance notice of new exhibitions, opportunities to test out new content--and encourage them to keep talking to their communities. I've written before about how this technique is used extensively in the gaming community to energize "community influencers" who both evangelize to other gamers and offer their feedback to game providers. Again, these community efforts can be online or physical. Many bands create "street teams" of energized fans who wear band shirts, distribute flyers, and become informal word-of-mouth machines. The benefits to doing this online are the trackability and the potential reach to visitors all over the Web. But creating a physical presence, and an opportunity to acknowledge and outfit enthusiasts, can also be valuable, especially for small communities or niche museums. Charlene and Josh don't specifically address how you can use these energizing techniques to turn negative opinions into positive (or at least neutral) attitudes and word-of-mouth, but there is an ongoing thread throughout the whole book about responsiveness and respect. If someone writes a review about your dirty bathrooms, inaccurate labels, or confusing wayfinding, you should react with thanks and action. In Groundswell's case study of the use of ratings and reviews at the online luggage store eBags, there is the story of a bag that got great reviews until one week when negative comments started pouring in about material defects. Rather than ignore the complaints or passively blame the distributor, eBags employee Peter Cobb contacted the manufacturer, convinced him of the defect, and demanded a fix. eBags believes and respects its reviewers, whether they are speaking positively or negatively. An energized community expects a response, and energized customers wield power within the community of customers. The message, for any company, is to listen and, whenever possible, to give customers what they desire most. How do you energize your visitors, members, and donors to spread the word about your museum? What are the pressing questions, needs, and conversation points that your visitors want to share with each other? On 8.6.08, the Computer History Museum (Silicon Valley, CA) hosted a Yelp! meetup for Elite Yelp! users. The event brought hundreds of hip, young professionals to the museum for lots of booze and partying. They left and wrote over 100 positive reviews of the evening, 12 positive reviews of the museum, and shared over 300 photos of their revels on Flickr. On 8.8.08, the Ontario Science Center (Toronto, Canada) hosted the 888 YouTube meetup for any and all YouTube aficionados. Again, hundreds of mostly young people shot hundreds of videos and photos featuring or on location at the museum. On 8.16.08, the Museum of Art and History (Santa Cruz, CA) hosted FreelanceCamp, a free unconference that brought 150 designers and techies from the south bay area together to talk shop. They left with free tshirts branded with the museum's name (and other sponsors), wrote about it on a wiki and shared photos on Flickr. To some people, these events may sound like losers. They don't generate rental revenue (usually). Lots of people come in for free to party and ignore the exhibits? That's not part of our mission! But these events have benefits both in terms of audience development and word-of-mouth marketing. Me: Have you lived in Santa Cruz for a long time? Other person: Oh yeah... several years. Me: Have you ever been to this museum? For me, my non-visitation was embarassing, but for these other folks, it was a fact of life in Santa Cruz. This art and history museum, despite having a great downtown location and some pretty excellent art, appears not to attract the software programmers and landscape architects of Santa Cruz. Heck, it doesn't even attract the museum exhibit designers. The unconference got lots of locals "in the door" who otherwise hadn't considered the museum a useful or interesting place. This is the ultimate erosion of the fear threshold--use the museum for something that people are already comfortable with. If you get people in a museum (or library) for WHATEVER reason, chances are they're going to notice the exhibits sometime. And hopefully, start to value them. Members of online communities talk online--a lot. Consider the experience of the Computer History Museum and their Yelp! event. Before they held the Yelp! event, the Computer History Museum had 15 reviews on Yelp! (and five of those were from people who had attended business conferences/parties there). In the week since the event, the museum has garnered 12 more mostly glowing reviews, presumably all from people who attended the event. That's almost a 100% increase in reviews. Plus, the event itself garnered over 100 reviews, also extremely positive. Yes, many of the event reviews focus entirely on the alcohol and the hotties, but the facility reviews are there forever, and they will significantly increase the profile of the museum on a site used by many to make leisure decisions. The key to these benefits is not the volume of online content produced but its reach. Don't look at the number of videos, photos, or reviews. Look at the number of views (how many times each has been accessed). The Ontario Science Center YouTube meetup didn't just spawn hundreds of videos before, during, and after the event. Each of those videos has hundreds or thousands of viewers. Some of the videos have as many as 35,000 views. And while not all of the videos mention their host by name (in fact, few do), the museum venue is frequently present in related text and links. Plus, folks who attended the event link to other videos shot at the museum, such as this "888 favorite" (shot in 2006) of someone using an exhibit. Number of views? 170,000 and counting. Provide activities or offerings that align with your desired image. A lot of the 888 YouTube videos and the Yelp! reviews talk about alcohol and partying. For the Ontario Science Center and the Computer History Museum, this is presumably considered a positive since it positions the institutions as cool places for young adults to hang out. But the thousands of people who view the resultant reviews and videos will form an impression of your institution based on them--so as much as possible, make sure that impression reflects messages you'd like to share about your institution. Work with communities that relate to your content and reach desired audiences. Are you a quilting or textile museum looking for fresh blood? Reach out to the Stitch and Bitchers or the Ravelry crowd. Are you a science center trying to prove you're not just for kids? Talk to the folks at Instructables. There are communities for everything online, and chances are you can find a group that offers a good blend of related interest and current non-visitation to your museum. Create custom elements for the event(s) that put your content at center stage. This isn't just about product placement (though that doesn't hurt). When you have your captive audience, customize your offerings so they can easily make the connection to why they might want to visit again. The New York Public Library has sponsored events for knitters in which they provide both a comfortable place to meet and a librarian who gives the group information about library resources related to knitting. Yes, getting new audiences in your doors is a start. But why not give them a little nudge while they are there? Invite them back. This is a two-fold suggestion. First, many online communities (or communities of any kind) are looking for comfortable, low-cost places to meet. If you start with an event, you may grow the relationship from one-off to a deeper connection with the group. If they are bringing in a desirable audience, content, and secondary marketing, why not make it a regular affair? Second, give people who show up for the event free admission for a subsequent visit. It's a nice way to demonstrate that you believe in their potential as museum patrons, not just appetizer horders. When useful, set up ways for participants to share their experience. The Ontario Science Center did an excellent job initiating a YouTube channel, Flickr group, and other elements to sort and track participant activity for the 888 meetup. This positions the museum at the center of the action, gives you an easy way to track online activity, and provides a useful service for participants to aggregate their content. Evaluate the outcome. Use online search tools like Technorati, Google blog search, and searches on individual networking sites to quantify the output of these events. Did you get what you wanted? This isn't all about numbers; some communities are small but can have huge positive impact. The bigger question is this: are the communities that come in contributing positively to the image, visitation, and online messages around your institution? If not, consider whether this is the right partner and where better friendships might be found. This week, we're covering the second objective in Charlene Li and Josh Bernoff's book Groundswell: talking (chapter 6). There is a basic difference between traditional marketing to customers/visitors and groundswell talking. The first is shouting. The second is conversing. This is true whether you are talking about marketing text or exhibit content. In this post, a discussion about the art of conversation in the groundswell. There are many levels at which you can “talk” in the groundswell. The simplest way is to be a commenter—to follow blogs and sites related to your institution and share your own observations and helpful tips. The next level is to produce your own talk, via profiles on social networking sites, a twitter feed, flickr group, blogs, podcasts, or online video. And the most involved level is to produce a place for talk—to manage an online community in which you are in constant conversation with your visitors. Many museums have jumped into the middle level—producing their own content—without starting with commenting. This is problematic for a couple of reasons. As Charlene and Josh point out, joining the blogosphere is like going to a cocktail party. You don’t barge in and just start talking—you listen, and you look for the right entry point to join in. If you start by creating your own blog and don’t comment on others, you may still be shouting, just in a new medium. 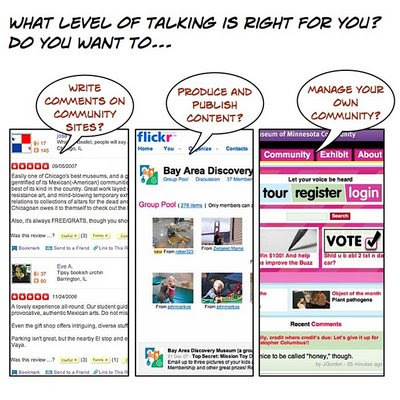 Many of the most active bloggers and Web 2.0 talkers do most of their talking on other peoples’ sites--check out this post from a blogger explaining why he comments on 36 blogs each morning. The other problem with starting in the middle is that it takes more time and effort to create and manage your own content than to comment on others'. For a big organization, creating a blog, podcast, or even a Facebook page requires an "initiative" complete with editorial plans, topic strategy, etc. When the initiative becomes unwieldy, talking of any kind is scrapped--even simple commenting. Consider the path of the Bay Area Discovery Museum. Their online talking began years before they started a blog this January. Jennifer Caleshu, their director of communication, is a museum talker extraordinaire. Yes, she runs the blog--but she also has an online persona—zeitgeistmama—with which she participates in parenting and Bay Area blogs and online communities of all kinds. Via zeitgeistmama, Jennifer is a positive, authentic ambassador for BADM to her local community as well as a world of Web-based onlookers. She started the blog after years of engaging with multiple communities, at a point when it made sense to upgrade her level of talking and she knew what kind of content would be successful. Because BADM takes an integrated approach, they can talk effectively across different websites and communities. Look at the BADM’s participation in the annual Gay Pride Parade in San Francisco. First, BADM took one of their core principles—support for all kinds of families—and extended that to justify participation (a kind of talking) in an outside, potentially controversial event featuring a good deal of adult-oriented revelry. They created “tykes on bikes”—a contingent of rainbow-wearing kiddies on trikes who march in a family-friendly area (where it’s a bit tamer). This is a no-tech way for BADM to talk about their values in a larger context. And Jennifer talked it up online. But she didn’t issue press releases or just blog about it on the BADM site. Because of her involvement as a talker in other online communities, she had natural advocates who publicized the event—and then Jennifer made sure to monitor the comments and answer any questions people had (check out the comments on this blog post). After the parade, she posted pictures on Flickr and wrote a thank you blog post that includes a roundup of other discussion about the event on the web. She clearly demonstrated that BADM is part of the diverse family community of San Francisco, both on the streets and online. What does it look like when a museum goes all the way to the top level and creates its own community for discussion? Two of the best examples are the Science Museum of Minnesota's Science Buzz and the Ontario Science Centre's RedShiftNow. Both are museum-run forums for visitors to post their own content and opinions. Note how ScienceBuzz promotes participation by putting the comments at the top rather than the bottom of blog posts. These initiatives, like the Proctor and Gamble beinggirl.com site profiled in Groundswell, are complex, expensive endeavors. If you want to go down this path, be prepared for a big financial and time investment. My favorite part of Groundswell is the in-depth breakdowns of costs and benefits of Web 2.0 initiatives. Most of these are at the level of huge corporations like GM whose marketing budgets are significantly larger than that of museums. But the categories of costs and benefit are still useful. For an executive blog, Charlene and Josh lists the one-time costs as planning and development and training for blogging executive, and the ongoing costs as paying for the blogging platform, IT support, content production (including executive time), brand-monitoring, and review/redirection. These come in at big figures, with a total of $283k and the largest contributor ($150k) assigned to content production. However, the benefits ($393k) outweigh the costs. They document benefits in advertising value (visibility/traffic per pageview), PR value (driving press stories), word-of-mouth value (referring from other blogs), support value (customer support calls deferred by content), research value (customer insights compared to focus groups). The largest $$ of these is PR value, and the smallest is advertising value, since pageviews are "cheap." They also link to an interesting study commissioned by MySpace and an ad agency, Carat, about the ROI of a MySpace initiative Carat produced for the Adidas shoe company, which suggested a strong and highly efficient correlation between exposure to the MySpace site and likeliness to buy. Should museums be looking at groundswell talking in terms of ROI? Sure. But in many cases, the benefits of groundswell talking--for example, reducing customer support calls or generating blog referrals--are not currently itemized elements of value in the museum industry. Whether you talk in the groundswell or not, benefits like pageviews and links from outside blogs are useful to track. Once you understand your current position in the groundswell, you'll be more able to gauge the potential and effect of Web 2.0 initiatives. Let's say you're ready to get engaged at the mid-level. You've listened to your community. You've started talking by commenting on other blogs and sites. Which institutional talking is right for you? Do you want to raise brand awareness? Groundswell profiles the story of the Blendtec, the blender company that stumbled into a viral video explosion with their "Will it Blend?" video series. By talking in a funny, unusual way, and doing so in an environment of lots of other talkers (YouTube), Blendtec was able to raise brand awareness at a fraction of traditional advertising costs. This is really tough. Creating a viral video requires extreme ingenuity, luck, and a little bit of ability to put your video up on video-sharing sites. Just putting it on YouTube isn't enough--you have to have a really surprising and appealing thing to share. Do you want to be part of the conversation? Join an already existing community, like Facebook, MySpace, or Flickr. You can put out a small amount of content to get started, and if people associate strongly with your institution, they will come. Charlene and Josh point out that the most important part of maintaining profiles in a community is responding to messages and comments you receive. The work comes in answering questions and cheerleading participation, if not creating a lot of content on your own. Do you want to explain diverse or complicated offerings? Josh and Charlene recommend not one but multiple blogs as a good solution to provide deep content on seemingly disconnected products. For example, HP maintains blogs on everything from printers to operating systems. Similarly, the Powerhouse Museum maintains five blogs: one on astronomy, one on photos from their collection, one on science and sustainability, and one that accompanied a special exhibition on the Great Wall, and one on digital media. As a large science and design museum, the Powerhouse struggles to tell "one story" about their offerings. Why tell one when you could talk to each individual constituent community in their own language? This makes the most sense for large museums, especially those that already have a couple of rogue blogs that are not coherently displayed together on the main museum website. Starting multiple blogs at once is a mess. Start with one for a specific, time-limited exhibition project (see the hugely successful LA MOCA Wack! blog for a single exhibition) and see how it goes. If possible, use a standard template to maintain consistency. If you use a third-party blogging service like Blogger, you can easily manage all of your blogs--both their content and traffic--from one place. Do you want to address misconceptions about your museum? If you are active in your local blogosphere, you have a natural, speedy place to address rude comments or inaccuracies. You can comment on their site, comment on a neutral site (like Yelp! ), or, when the going gets really rough, post on your own blog. Executive blogging is a powerful way to get directors' voices out in a world where reporters are watching. If something happens like the recent controversy over dumbing down of science at the Franklin, you don't have to wait five days to get a letter to the editor published. You can respond right away via comments and a defense on your own blog. What are the most effective ways that you use talking in the groundswell? What do you see as the mark of a great conversationalist? It’s true. 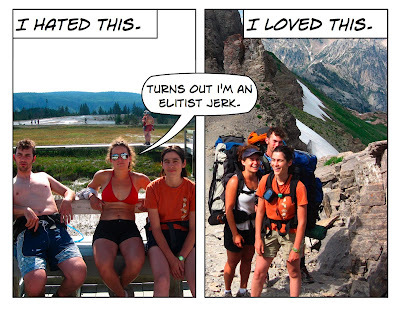 I went to Wyoming and learned that I am an elitist when it comes to national parks. I like my parks hard to access, sparsely populated, and minimal in services. It’s an uncomfortable truth which is forcing me to examine my arguments for inclusivity, access, and populism in museums. I visited two parks last week: the Grand Tetons and Yellowstone. In the Tetons, I had a highly exclusive, hard to access, fabulous experience. I carried a 40-pound backpack up and down mountains and across snowfields for four days with friends. It’s an experience that requires permits, maps, physical ability, gear—a long list of barriers to entry. Few people go for it. That’s part of why I love it. Yellowstone, on the other hand, was an access dream—and my nightmare. You could drive right up to the geysers. There were wide, flat, paved paths between the natural features. There were benches to sit on, interpretative signs to read, ice cream to eat, and trinkets to buy. There were people and trashcans everywhere. I hated it. I realize that I have more frequently advocated for Yellowstone-style museums than Grand Teton-style ones. I believe in lowering barriers to access and creating opportunities for visitors to use museums in diverse ways. On this trip, for the first time, I truly understood the position of people who disagree with me, those who feel that eating and boisterous talking in museums is not only undesirable but violating and painful. For elitists, it’s impossible to ignore the ways others are degrading what is for you an intense aesthetic and emotional experience. I get it now. I felt it at Yellowstone. Understanding what it feels like to be the elitist jerk helps me have a more nuanced perspective on inclusivity and access. Yes, I am a jerk—but only when it comes to my own experience. I and my outdoor values are in the minority. The national parks do not solely, or even mostly, belong to me and my backpacking friends. They belong to the millions in RVs who make the trek to Yellowstone and Yosemite every year. Providing services to support and encourage their visitation makes good sense. They are the great big public, and giving them comfort and access makes national parks a valid and worthwhile alternative to theme parks and resorts. And while I may have had a day of frustration, supporting their experiences ultimately doesn't hinder mine. I don’t need Yellowstone; I have hundreds of remote, gorgeous mountains to climb in my life. For the people who will never engage at that level, Yellowstone is a necessary, useful option and an entry point that may inspire a few folks to increase their outdoor prowess and join me off the beaten path. As an experience consumer, I have the luxury of being a jerk. It’s acceptable for me to only respect the parkgoers and services that reflect my values. But if I were a parks interpreter, an experience provider, that attitude would be reprehensible and highly derogatory towards guests. And herein lies a reason (one which previously eluded me) inclusivity is looked at skeptically by some museum leaders. They are elitist jerks! Museum directors love museums so deeply and are such sophisticated users of them that they want to protect the kinds of experiences they would choose to have as visitors. I feel fortunate that when it comes to museums, I am more similar to the bewildered, skeptical public than the sophisticated few. I don’t feel the pain elitists feel—I feel the pain that the vast majority of visitors feel. And so I look back on the thousands of people who streamed by me in the Yellowstone parking lot with revulsion—as a jerk. But I also identify with them and look at them with hope and excitement. They are at the park. They didn’t have to be there, but they perceived something of value there and they came. They drove thousands of miles, and they deserve to roll along flat paths in their wheelchairs and strollers. They deserve ice cream with their geysers. As an elite park user, I have plenty of resources at my disposal, from maps to rangers to well-maintained backcountry trails. The Yellowstone visitors, who account for a hugely larger percentage of park visitors, deserve great resources as well. And it’s okay if I don’t care to use them. Posted by Nina Simon 17 comments, add yours! This week, we're covering the first objective in Charlene Li and Josh Bernoff's book Groundswell: listening (chapter 5). This is a long post focused on strategic uses of listening rather than specific techniques. Please let me know (since I'm listening) whether this length is a benefit or a detriment to your experience. At the end, we'll talk about Charlene and Josh's insights about the consequences of good listening--an important thread that will run through each of these Groundswell posts. the Exploratorium is inundated by kids (source: Yelp! reviews). Many adults think it provides a good adult experience but that engaging with the exhibits requires waiting and or wading through lots of running, yelling kids. the Exploratorium did something really big for the August 1 eclipse and they are all over Second Life (source: Technorati). The majority of blog traffic mentioning the Exploratorium in the last month has focused on their coverage of the eclipse and a variety of Second Life initiatives. the Exploratorium is a place high school/junior high students go on field trips and make snarky videos at their teachers' behest (source: YouTube). I watched many entertaining shorts featuring students explaining exhibits to the beat of popular and illegally uploaded music. I attended the Fisher Investment party as a plus one and WOW!!! a completely different side of the Exploratorium (also because I was drinking all night)... I felt like Elizabeth Taylor (during her Cleopatra era 1963). She then goes on to say that maybe she should take dates there or consider getting married there, but ends the post by deciding that she should stick to taking her loud cousins to visit. This woman functionally had two brand views of the Exploratorium: one by day and the other by night. What could the Exploratorium offer that would bring this woman back for another exciting, glamorous experience? Perhaps a "museum by night" campaign shouldn't offer more of the same but should instead feature this entirely different institutional vision. Good listening breeds potential. The Exploratorium may be a kidfest by day and hipster central by night. Are they maximizing the opportunity in both of those perceptions? By listening, the institution can talk with greater confidence about new paths to take, energized by the glimmer of what is already being said and asked by the groundswell. What if you check out your museum on the Web and find... nothing? What if you want to listen but can't get far enough with brand monitoring? Most museums are not as large as the Exploratorium or the businesses covered in Groundswell. But almost all museums have something that few businesses can boast: direct contact with customers. We don't have to go out and find the people drinking or wearing our products. They're right in front of us, and we can enlist them into intimate communities to help us listen. The listening we do in museums right now is pretty expensive and limited. Surveys, interviews, tracking studies, and exhibit evaluations are often isolated events, and the information gleaned is specific to particular projects. In Groundswell, Charlene and Josh suggest that these kinds of research projects suffer as listening opportunities because they don’t provide the kinds of insights that people operating in communities can give. When I watch the videos teens created at the Exploratorium and post on YouTube, I see the aspects of the exhibits they thought were most important to share with their classmates. They are creating that content within the context of a community, and that community both fuels their creation and provides me as a viewer with new insights about the key elements of their dialogue about the museum. A survey provides answers. A community provides insights. So how can your museum foster this kind of community for research? Charlene and Josh describe companies that provide custom communities—the people and the closed social network to support them—for the bargain price of several hundred thousand dollars. But museums don’t need to hire firms to find the people to involve in the community. They are our visitors and most especially our members—people who have already expressed interest in being part of the “museum community” in some form. Engage your members as community board members. Like board members, museum members want to contribute to the institution. They are thrilled to test new programs and exhibits. These people may be interested in starting a community with minimal museum support as long as they understand that someone is listening (and will act on that listening reasonably). No one is going to volunteer advice to the museum if they don't think it will be used. But if you express your sincere interest, I believe the ideas will come pouring in. Listening is an active behavior. It implies acknowledgement and response... and opportunity. Once you have a mechanism to listen to your visitors—whether out in the world or within a community you initiate—you will have the confidence to take on strategies that will proactively address the communities’ needs. In Groundswell, Charlene and Josh provide an instructive case study about the Mini car company, which used listening to determine that they should target their marketing toward current Mini owners, not potential buyers. This may sound strange, but Mini determined via brand monitoring that they had an extremely enthusiastic, Web 2.0-active owner base that was not being sufficiently engaged in their marketing campaigns. Mini launched a campaign of owner rallies and special coded mailings intended to support the evangelizing actions of owners. They listened, they crafted a response, and sales went up. When you listen, you may be comparably surprised at where the next opportunity lies for improvement in your museum. Maybe you have members who are just waiting to host museum-related events in their homes. Maybe you have partners who would pay for corporate training programs under your brand. Maybe you need to consider changing your hours. Without good listening, these all sound like risks. Listeners don’t tell you what to do, but they can help guide the choices you make in greater confidence. Good listening behaviors can increase ticket revenue. It’s hard to correlate online buzz to sales, but Charlene and Josh present a few cases in which positive online discussion led to upticks in sales about a month later. When it comes to museums, which don’t generate the same volume of online discussion as many large companies, anything the institution can do to increase online discussion will increase brand awareness, which can translate to web and in-person visitation. The use of listening to craft responsive strategies can also be used to improve exhibits and programs. Listen to how visitors describe your exhibits to each other—either on the Web or in response to your community engagement questions. Are they learning and sharing what you hoped? The museums that provide communities for visitor content—even incidental ones like the Ontario Science Center’s stop motion video clips—can monitor and learn from visitor-created content. When you have a constant vehicle for listening, you can use that community as a real-time, responsive research tool to see how well you are meeting your exhibit goals. Two years ago at the ASTC conference, an exhibits director told a story about giving clipboards to all of their teen floor staff with a list of every exhibit in the museum. The teens were asked to rate the exhibits, and then the exhibits department held a meeting with the teens to review their observations based on their time on the floor. The experience, the director commented, was so painful that they would never repeat it. The staff simply couldn’t listen to what the kids had to say. It is really hard to listen. It’s easier for us to say “yeah but” about the messes we choose to ignore or won’t believe in. It’s easier for us to say that floor staff are our eyes and ears with visitors than to live up to that statement. But we’ve got to get over it, because listening gives us an opportunity to improve what we do and be more successful. And there’s a downside to closing our ears. Last week, I stayed at a hotel with lousy hospitality in DC. The manager treated me terribly. And as I was standing there at the desk, tired and frustrated, I had a sudden revelation. That manager was no longer the end of the line for me. I could write about this experience on Yelp for a community of listeners who care--other consumers. I wasn't going to write to the hotel: why should I expect anyone up the line to listen or treat me better? I was going to write to my community. If we open our ears, our museums and businesses can join these communities. When people share their opinions publicly, they give institutions a gift—an opportunity to listen in. When institutions choose to listen and respond, it changes the way you do business. There may be confrontations between the institutional listeners (often in marketing) and the content developers (who may not believe what they hear). Charlene and Josh urge institutions to make sure that their listening is used actively, shared among many departments, and has champions on the executive team. Otherwise, it’s likely to fall on deaf ears. Have you had a painful or positive listening experience you'd like to share? Or a specific question or idea about how to do it well? I’ve received a few inquiries over the last year about museums and geocaching. So I felt lucky last week to learn not only about an innovative arts exhibition employing geocaching, but to discover that its exhibit developer, Seth! Leary, is something of an expert. I sat down with Seth! to ask him all the dumb questions about geocaching and museums you can imagine… and a few more. Thousands of people geocache for a variety of reasons: to explore new places, to have outdoor adventures, to search for surprises out in the world. Seth! commented that the demographic of people who are involved is much broader than you’d think, including lots of families looking for a fun, educational, free activity. Sounds like there might be some overlap with your museum audience? Both geocaching and museums are fundamentally about exploration and discovery. Both relate to the human drive to collect stuff. Both attract locals and tourists who may travel out of their way for the thrill of collecting another place or experience. And in an industry where many of us are scratching our heads about intelligent uses of technology that don’t tie visitors to computer terminals, geocaching stands out as an activity that is mediated by technology but also promotes exercise and outdoor activity. The city of Bellevue, Washington holds a public art sculpture exhibition every couple of years. For a related teen project, I was invited to teach roughly 200 middle- and high-school students about geocaching (a GPS-based scavenger hunt) so that they could send miniature sculpture pieces out into the world. The process is somewhat involved, but fairly simple. Each student would create a fist-sized sculpture piece (of recycled or renewable materials; the theme was "green") and the sculpture would get a Travel Bug tag with a unique serial number. The sculptures then get placed in a geocache where members of the public (geocachers) can pick them up and move them to another geocache. The little works of art then travel around the region, transferred from person to person via the hidden geocaches. Each leg of their journey gets logged online by the geocachers so that a continuous travelogue is created, including any photos that the geocachers choose to post. The sculptures then make their way back to City Hall (hopefully) where they are displayed in an exhibit that will be up until October. Traveling public art! Each geocacher is a curator and registrar and art appreciator along the way. The “travel bugs” that Seth! refers to are dog tags with unique serial numbers on them that geocachers can use to track items easily online. You can check out the path of some of the teen sculptures here. Click on a sculpture, and you’ll automatically be taken to the geocaching.com page for that item, and if you scroll to the bottom, you can see the path the sculpture has taken thus far. Some of the people who picked up the sculptures intuited “goals” for the sculptures, such as this hungry whale sculpture which was taken to the aquarium for a photo shoot by one energetic geocacher, and later went to the “travelbug hospital” at another benevolent person’s home for repairs. These 200 teen sculptures are being released in stages, with the hope that most or all will find their way back to City Hall by the end of the exhibition in October. Some are already on display along with the stories of their travels from City Hall and back again. I asked Seth! what challenges came with this project. He talked about the volume of sculptures—that with 200 pieces going out from one location, it was tough to energize the local geocaching community to really get each of the sculptures moving on an interesting narrative. And indeed, some of the sculptures haven’t gone far since they were first launched from City Hall. Seth! also talked about the importance of marketing events and programs like these specifically to the geocaching community. There are robust community discussion boards on the Web for geocachers as well as state and local associations. Because taking up geocaching is not entirely casual (you need to invest in the GPS receiver), it’s important to energize locals in that subculture for a project like this to succeed. It expands the audience for the sculpture exhibition. It engages subculture of demographically mixed folks (geocachers) with a museum-related art activity that they might not otherwise have been drawn to. It sends art out instead of locking it in. This is a project that breaks down the walls of the exhibition and gets the collection out on the road into the community. It invites people to engage with collections in a new way. The person who picks up a whale sculpture and takes it to the aquarium is having an active, two-way relationship with it. Geocachers value their finds and care for them, direct their travel, and write their own narratives into the items. It plugs into a ready-made, programmatic, technology-mediated activity at very little technical or financial cost to the institution. All Seth! had to do was purchase the travel bugs ($5 apiece, to track the sculptures), launch the sculptures from a registered geocache, and set up the individual item pages on geocaching.com. From that point on, it was geocachers with their own GPS receivers who found the sculptures, logged their stories, and kept them moving. First, get someone on your staff to try finding a cache. Like any technology, you should try it first to see what it’s about so you get a sense for how it works. It’s very easy; you can go onto Geocaching.com, type in your zip code or address, and you’ll probably find a few caches within miles of your home. You’ll need a GPS receiver (some smartphones do this now) and maps are useful. Then, determine your goal – why do you want to do this with visitors? There are lots of possible reasons. It could be to hold programs or camps to help people understand the GPS technology, like orienteering. Or the technology could be incidental and you could just be encouraging people to go out and experience certain areas of the community. You could launch your own items (I’d recommend doing just a few unique ones) with travel bugs and assign them goals: travel to another museum, or move every 24 hours, or whatever would serve your interest and make a fun game. If you had just a few compelling items, you could really get enough players interested to rally. But if you want something easier than sending out items, the simplest way for museums to use geocaching is just to place one. Make a nice geocache and hide it on the grounds, somewhere that is hidden but easily accessible without trampling the shrubs. Then, post a well-planned geocache page to go with it. Add some history about the museum or the area. Geocaches cannot be "commercial" so one has to be careful about over-promoting on the web site. But simply having a presence on Geocaching.com with a cache will bring visitors to the door. This is especially helpful for small museums that might get overlooked by out of town visitors or even the locals. This is a pretty low-effort project on the part of the museum but can have fun results. History museum or other locally-themed museums might make a project for volunteers or teens that involves gathering waypoints (coordinates) for places of interest and then putting together a virtual map/tour. The waypoints could be put into a file (.gpx or .loc) which can then be downloaded by users who would go out to visit the sites. It might be accompanied by a podcast, so it becomes a city-wide audio tour! I know there are several geocaching enthusiasts in the museum community. I’d love to hear your stories of why you do it and how you’d like to see it happen in museums. What do you see as the challenges and opportunities? And how close is the closest geocache to your house? You may be surprised (I know I was)!